« M&M/Mars Not Going to Cheat on Their Chocolate! …and I just recently found an excellent ‘from scratch’ brownie recipe on the web (all over the web, actually, it seems to be a very popular recipe!) 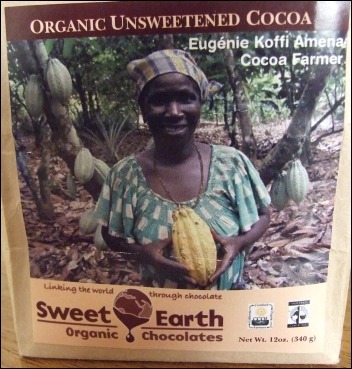 that just begged to make use of this cocoa stash of ours! The recipe (below) is very simple and easy to put together. All of the ingredients dissolved into a wonderfully deep chocolate brown goo, to which I also added a cup of chocolate chips just to be excessive. The brownies turned out to be, hands down, the richest, most delicious brownies we’ve ever eaten! 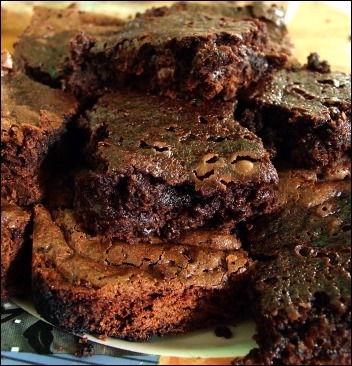 I know the photo’s a little dark, but I realy wanted to convey the richness of these brownies! All but the center cut brownies had that nice flaky top, and the center cut ones were just a little moister, but didn’t collapse after being taken out of the oven. I don’t think I could ever go back to box mixes after having these. 1. Preheat oven to 350° F. Lightly coat a 9 x 13 x 2-inch baking pan with cooking spray or vegetable oil. 2. In the mixing bowl, combine cocoa and baking soda. Add 1/3 cup melted butter and the boiling water and stir on low until the mixture thickens. 3. Stir in sugar, eggs, and remaining 1/3 cup melter butter. Mix until smooth. 4. Add the flour, vanilla, and salt, and mix completely. Stir in nuts or chips, if desired. 5. Pour into the prepared pan. Bake for 30 to 35 minutes or until brownies pull away from the sides of the pan, but watch them carefully after 30 minutes to make sure they don’t over bake. Cool completely in the pan. Cut into bars.